August | 2013 | That Was an Accident! 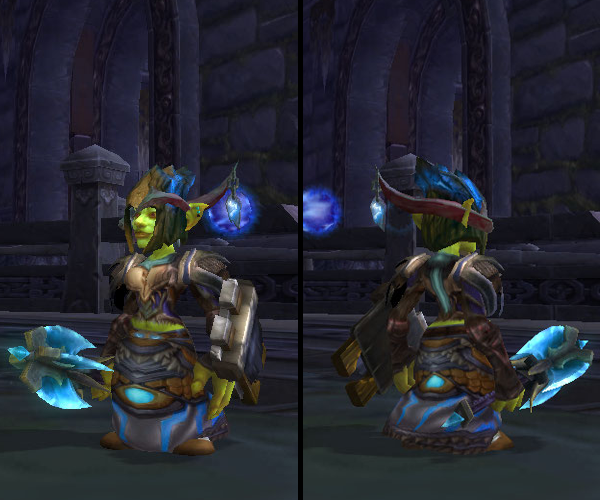 Thoughts: And here we have Electrika’s latest set, intended for use specifically with her resto spec. I’ve found that if I’m going to carry two sets of armor for different specs, they have to be mogged VERY differently – otherwise I never remember to switch my dang gear. Elemental and resto can kiiiiiiiiinda get away with that, of course, but when you REALLY want to throw some lava around, a set of gear with less spirit and more haste is better. 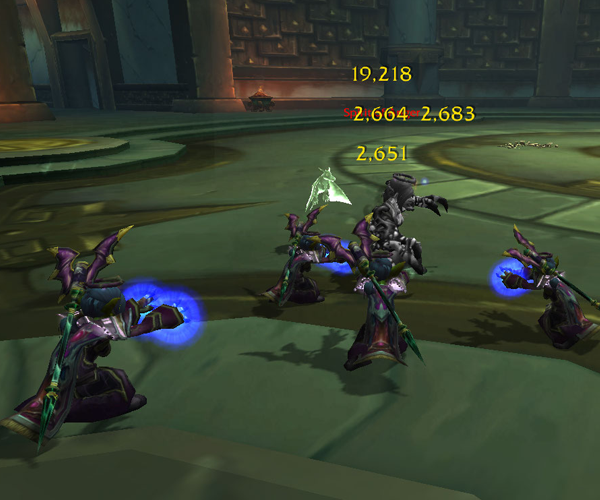 It was difficult to get a run for Bastion of Twilight normal, so when I logged on one evening to discover that my guild was inexplicably doing a Bastion of Twilight heroic run, I got super excited. 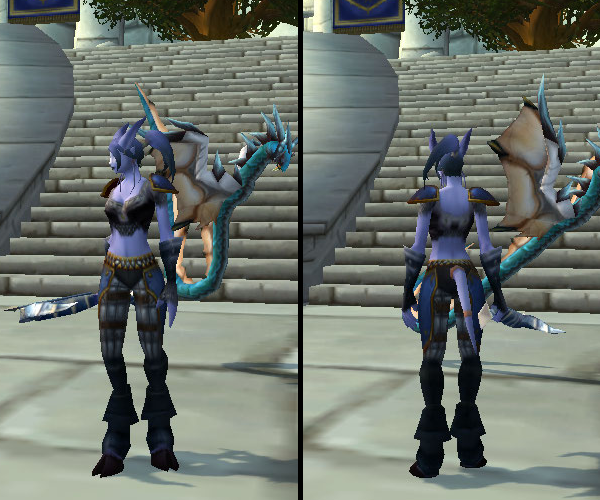 Uuuunfortunately, I totally compete with the very nice hunter in the guild for mail transmog gear. 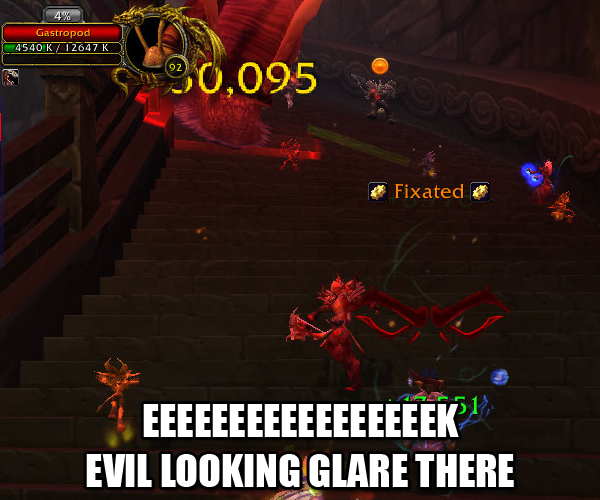 So when the helm dropped, I had … well, I had a moment. I was remembering how long I’ve wanted the blue treestump hat, remembering how hard it was to get in the joint with a group in the first place, remembering all those times when I’ve gone farming for gear only to not have it drop for months, etc. etc. So my inner goblin totally took over and I threatened to murder his poor sporebat if he won the roll. I won, much to the sporebat’s relief. … in hindsight, though, I’m not sure my karma will ever recover from threatening to take down a sporebat over a hat. This entry was posted in Bombelina, Goblins, Mail, Transmog, World of Warcraft and tagged bombelina (formerly electrika), bulwark of the noble protector, carapace breaker, goblins, grips of chronological events, helm of the nether scion, infection resistant legguards, lifecycle waistguard, mail, nixod's chain-threshed spaulders, shaman, silvered bronze boots, transmogging, world of warcraft on August 29, 2013 by Prinnie Powah. Esplodine had been sitting at 88 for a very, very long time. Since February, to be exact, when she was last spotted in the Valley of Four Winds making imperial silk and turning all the moths into floating baby polar bears. (This was also prior to being renamed something more appropriate for someone who considers “running around in circles casting the circular Arcane Explosion” to be a legitimate rotation.) Despite the fact that I make a point of getting all Pandaland level alts hearthed at the Shrine ASAP, she had never, ever moved out of the Goblin Slums in Orgrimmar. It just so happens that she’s also got tailoring and enchanting maxed out, and I’m getting kiiiinda tired of buying expensive enchants. (Also, additional bag space is always highly attractive.) Hmmmmmmmmm. Esplodine’s hour had come. I gotta say, she got a little overconfident. Knowing that she’s a bit challenged when it comes to mage-ing “properly,” Esplodine didn’t bother going to Townlong or (Gawd forbid) the Dread Wastes. Instead, she hung out in Kun-Lai, where she safely trounced all the things – with a few exceptions. But even the exceptions made her a little cocky – sure, she had to flee from four or five hozen that one time, but she lived. 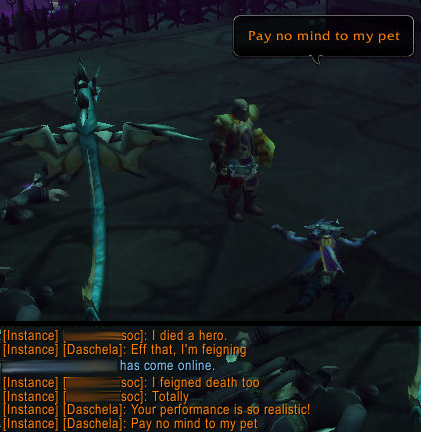 Ok, so she only had like, 200 HP left, and if a CRITTER had hit her, she would’ve been toast. BUT NOTHING DID, SO THERE. Sprites? Yeah, whatever. Her own anger? Ok sure, no problem. It’s a nice shot otherwise. She breezed through to 90 on a combination of rested EXP, Slow, Blink and, of course, Arcane Explosion. 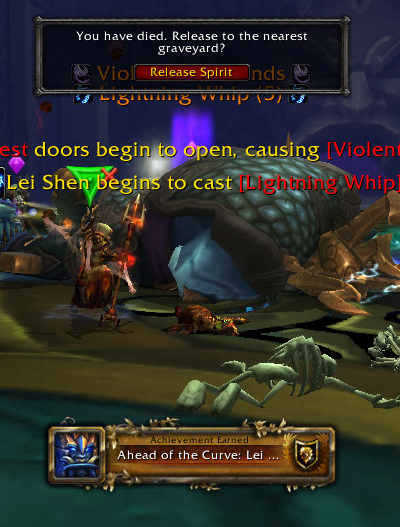 So upon hitting 90, she decided she was gonna help out the Darkspear at the last minute. The scenarios went fine (thanks to Cav doing like, 100k+ damage). 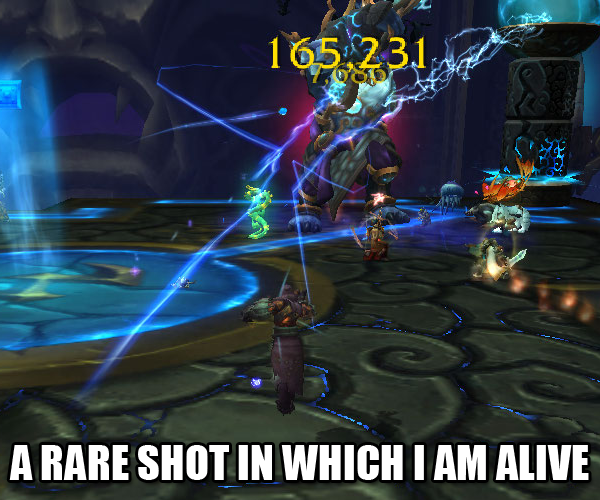 Being ranged, she survived killing a few commanders in the Barrens for a few resources. 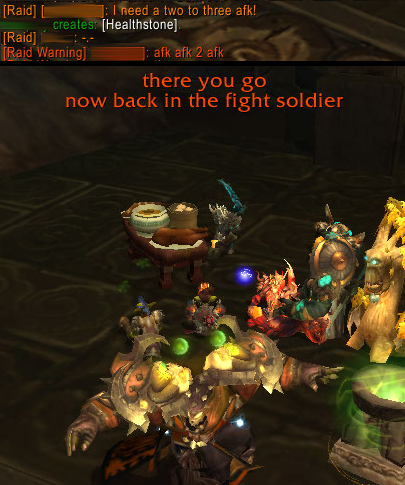 She took them back to Vol’jin, both expecting the Kor’kron attack and expecting it to be no big deal. She tried to be careful. 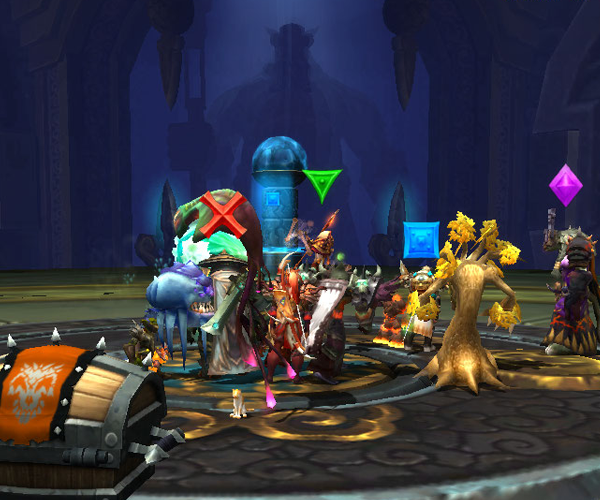 She tried to pick off the single Kor’kron here and there. It’s just that every freaking time she tried these things, four or five freaking Kor’kron would stomp over and smash her face into the red desert dust. Esplodine being Esplodine, however, she did not despair. No, she spotted a shadow priest nearby, and thought, “dude, they got Power Word: Shield. And heals. And, frankly, I can use any help I can get.” Random invite to perfect stranger? NO PROBLEM. It’s safe to say that the perfect stranger did not expect what watching Esplodine operate would be like. Eff that dignity thing, I’m going for SURVIVAL. 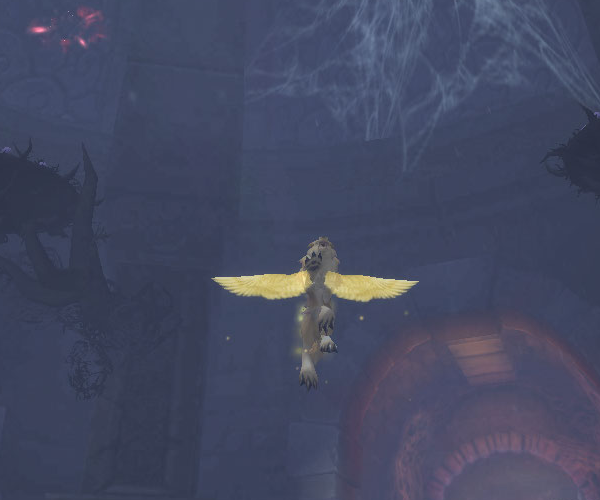 The moment four or five more Kor’kron made a beeline for her, Esplodine took off running. Slow one, sure. Blink, absolutely. Buttonmash the ice shield thing until it comes back up? Yep. Stop running? HELL NO, NOT UNTIL DEATH ITSELF TAKES ME. Rocket Jump! Frost Nova! Nether Tempest! Did Arcane Missiles just proc? Too damn bad, she’d have to stop running and turn around to use it. BLINK! Even with the assistance of a shadow priest, she still got flattened in Razor Hill. What? You want me to port all your level 1 bank alts to the Shrine? As long as you’re payin’, I don’t see why not. This entry was posted in Esplodine, For the Horde, Baby!, Goblins, World of Warcraft and tagged /omg, death and destruction, drinking in warcraft, esplodine (formerly centina), goblins, maybe someday will be better, oh the goblinity, that's probably not good, world of warcraft on August 19, 2013 by Prinnie Powah. As you no doubt know (since I recently reminded you), I /flirt with all the long-haired blood elf men ever to see what they will do. Most of the time, I get ignored. This is most likely a consequence of being short and green unconventionally attractive. 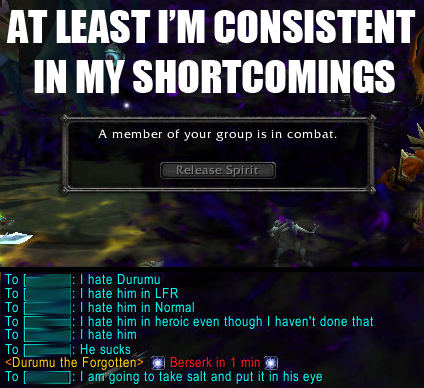 (If we’re going to be sensible here, it’s also a result of WoW being a game.) Occasionally, the flirtees will /flirt back, or tell me /no. Every now and then I’ll come across a real gem, like the guy who told Alexalis he was a bit out of her league because of his amaaaazing hair. As far as I’m concerned, it’s just for sheeyits and giggles – an experiment for laughs, if you will. 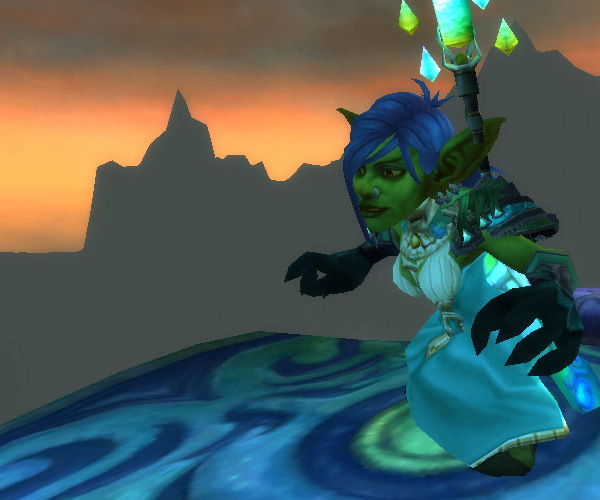 I was in a Terrace LFR a week or so ago on Electrika, testing out my new wireless router. After we beat the Sha (uh, adds? Anyone on adds? 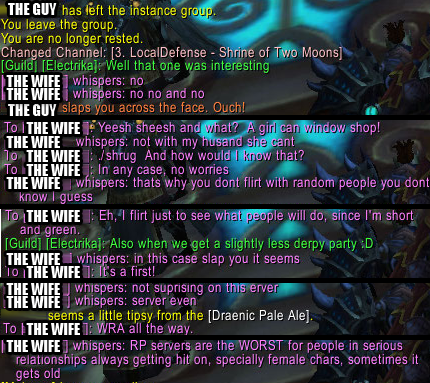 Seriously, anyone, please kill adds), I spotted a likely test subject and shot off a /flirt right before he dropped party. I didn’t think a thing of it. 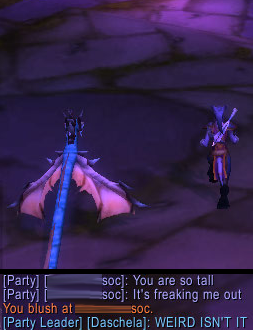 It’s not Serious Business to me, and since blood elf men are a dime a dozen, I’ve been ignored before. 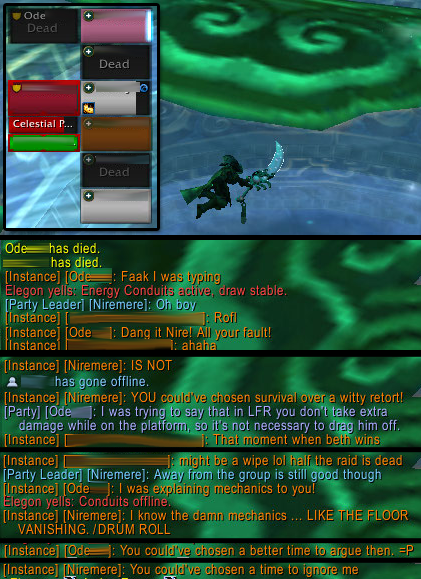 Might wanna roll on a PvP realm next time? Which brings me to this question: how should real life relationships be reflected in game and subsequently be treated by others in WoW, if at all? I’ve only ever dated a couple of gamer guys, and both were more into console fighting games than MMORPGs (though I did drag one into a short-lived Ragnarok Online addiction). Generally, I’m of the stance that as long as things don’t get hot and heavy (the partner in question doesn’t ERP, get emotionally involved or actually meet the person), then things are cool. I don’t particularly care if some random player /flirts with his avatar or not, since for all I know, the person doing the flirting could be a 50 year old guy living in a different country. Yet this chick (and her guy) obviously had a far different take on the issue. To her, the /flirt emote always has intent to pursue behind it, and the intent itself is offensive. She finds that it puts her and her relationship on the defensive, which is tiresome, even more so because it (apparently) happens regularly. I suspect that she is tired of being flirted with specifically because she is female, as well. This further contributes to her irritation when I flirt with the wrong guy. In real life, it’s much, much easier to pick up on “we’re in a relationship” cues than it is in game. Then there are general “rules” that are followed by most – such as, you can look, but you can’t touch. In the digital realm, however, these cues are much harder to come by and uncertainty poses a challenge – how are people supposed to behave if they don’t know? If we continue to distinguish between “real” and online game life, should others respecting your relationship even matter? After all, in that case, it would have little effect upon the real world. Should /flirt be considered an innocent transgression by the unknowing, or a romantic aggression by someone who does not care? This entry was posted in Bombelina, For the Horde, Baby!, Goblins, Oh Sheeyit Screenshots, OMGWTF, World of Warcraft and tagged /flirt, /omg, bombelina (formerly electrika), goblins, maybe someday will be better, oh the goblinity, online relationships, that's probably not good, world of warcraft on August 14, 2013 by Prinnie Powah.